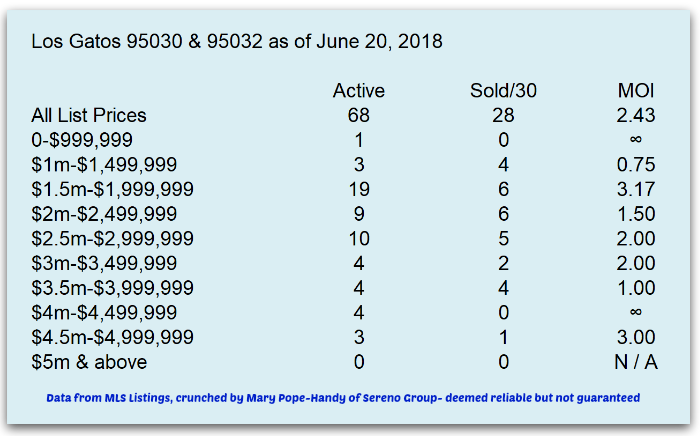 Today I’m able to share with you some statistics pulled together from MLSListings.com by Timothy Proschold of Sereno Group Los Altos (which he’s given those of us in Sereno permission to share). 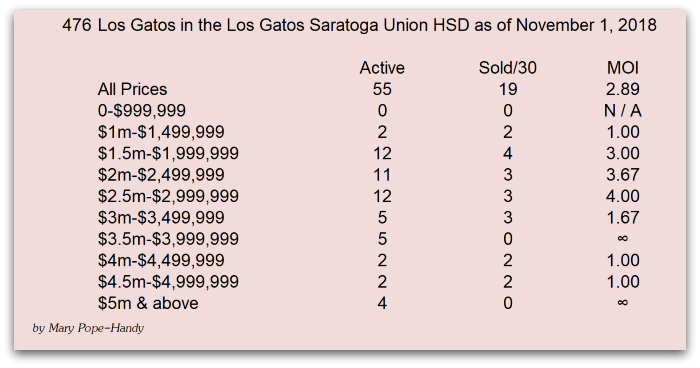 I thought my readers would really appreciate this statistical history of sales in Los Gatos and Saratoga from 2005 to 2014. A quick, but important, note on the areas included for Los Gatos. 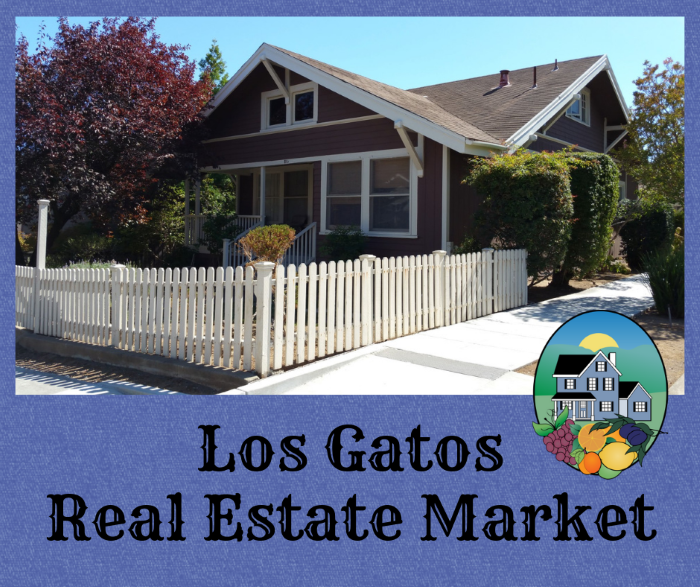 “Los Gatos”, as a mailing address and as an area searched on the MLS, now includes the Los Gatos Mountains (95033) as well as the “in town” or the unincorporated areas close to town with the zip codes of 95030 and 95032. (This is a recent change in the way MLSListings collects data – and it’s messing with us!) In the study below, all three of these areas are included. If you are looking at 95033, these figures will be a bit high, and if you’re considering 95032 or 95030, they will be low. So while we often do compare and contrast Los Gatos and Saratoga, the gap in pricing will be more acute because of the more rural areas include. Be that as it may, this is great info that I think you will find very valuable – and thanks again to Tim for compiling it for us! First, the price per square foot for single family homes (SFH) in Los Gatos and Saratoga (these might shake out differently by school district, price point etc.). Similar patterns overall, but Saratoga is currently making a steeper climb in housing values. Next, the median sale price and average days on market (DOM) from 2005 to 2014 for houses or single family homes in Los Gatos. The Los Gatos real estate market is very healthy, with a strong sale price to list price ratio. As with the rest of Santa Clara County, inventory is extremely low, and that is pushing prices up. Today we’ll get a view of the market using just a few charts, but please click on the links for more info (or call, email or reach out to me if you’d like an appointment to discuss your segment of the market in particular). First, a chart from my Los Gatos Real Estate Report (click on the link for more information). The Blossom Hill Manor (aka “the Manor” or “Blossom Manor”) is a very highly sought after neighborhood with its close proximity to the highly regarded Los Gatos schools, parks, shops, grocery stores and major transit routes. Homes there are well maintained, many streets are tree-lined and there’s a good amount of community spirit and involvement in this close-in area. The real estate market in Los Gatos has been steadily improving since the low point in about 2009, but there’s a great deal of variation from one area, price point, school district, age and condition of home to the next. The “fixer” market is different from the luxury market. What of the Manor? How are prices today compared to the peak in about 2007? Are home values at or near the high point? The short answer is this: not yet, but getting there. Many of the indicators show consistent appreciation, a buyer population that wants homes there faster than they can come on, and generally very favorable selling conditions. It is not yet a crazy, overheated market – but if the shortage of inventory continues (today there are NO homes for sale except one which is already sale pending in Blossom Manor) and demand continues, it may go that way. 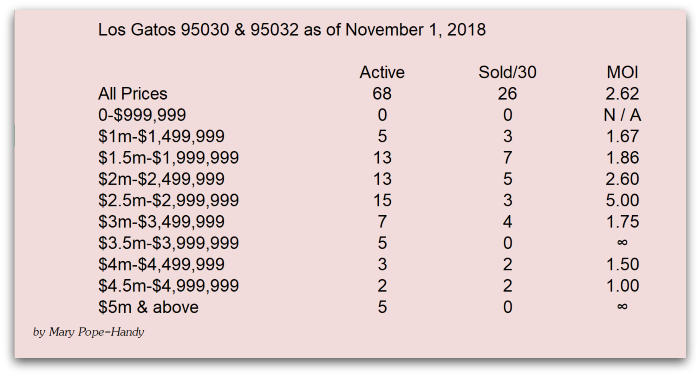 December was a good month for sales of houses in Los Gatos, showing a dramatic 63% increase in the number of closed sales over the month before. Inventory was down sharply too, further increasing the odds of a sale in December. With lower inventory and buyers jumping on interest rates as they began to creep up, it was a sellers market for this part of the Los Gatos real estate market. For many more details, click on the link below. A sumary of the number follows directly beneath it. December 2010: Sales increased 63.2% from the month before, and were up 14.8% year-over-year. Prices slipped in Dec 2010 with the median price dipping 13% from the previous month, down 15% compared to last year. The average price fell 7.4%, a yearly loss of 10.3%. Inventory fell 26.7% from last month, and was down 10% year-over-year. The Condo market in Los Gatos is another story! December saw a slight improvement in market conditions but it remains a buyers market for Los Gatos condominium or townhouse buyers. The prices (average and median) both slipped, as did the list price to sales price ratio, accompanied by a longer “days on market”, underlying the soft market. December 2010: Sales increased 12.5% from the month before, and were up 12.5% year-over-year. Prices slipped in Dec 2010 with the median price dipping 7% from the previous month, down 7.4% compared to last year. The average price fell 6.6%, a yearly loss of 16.5%. Inventory fell 18.8% from last month, and was down 20.4% year-over-year. The real estate market will vary based on zip code, school district, price point, square footage of home & land etc., so this is only a very broad overview. Information for your home’s segment of the market could be very different. For instance, there’s a huge difference betwen the luxury home market and the entry level markets in Los Gatos. Often there’s a big gap between a “walk to town” home and one that’s remote. So too with “sale type”: regular vs short sale vs bank owned. Loads of variables. Please contact me for specific info on your area or part of the market. erly reports or view sales around any address in Santa Clara County (Campbell, Saratoga, San Jose and also areas of San Jose such as Cambrian Park or Almaden Valley) by visiting www.popehandy.rereport.com. Interested in selling or buying a home in Los Gatos? Please call or email me today! 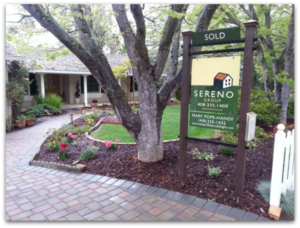 Today on my Valley of Hearts Delight blog, I posted a long article on the Monte Sereno real estate market. In places I compared and contrasted it with the Los Gatos & Saratoga markets, so readers of this blog might find that piece interesting as well. 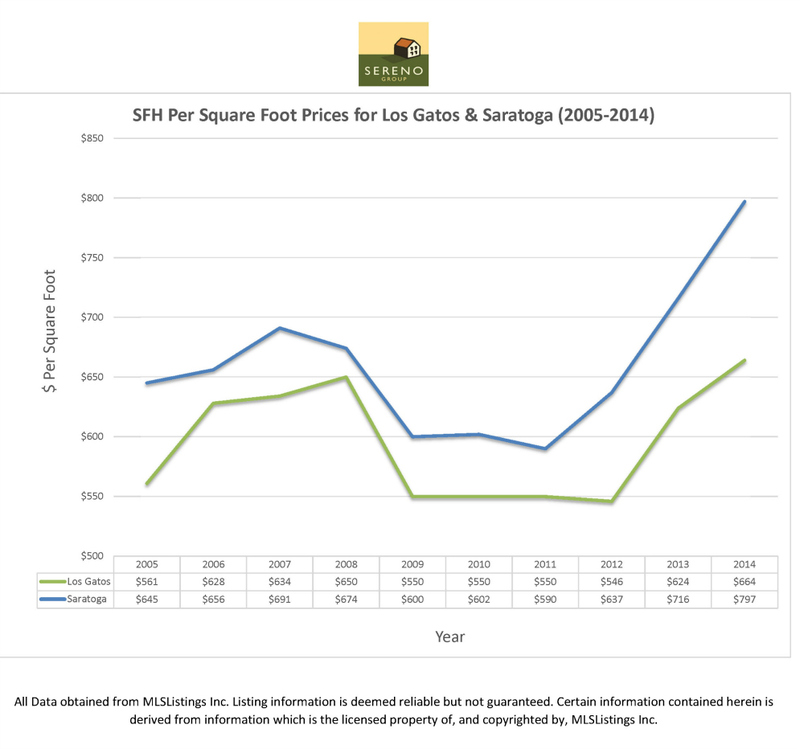 How is the Monte Sereno Real Estate Market Faring? How Does It Compare to the Los Gatos Real Estate Market and the Market Two Years Ago? Monte Sereno is a lovely, upscale residential community of about 4000 people. It’s located adjacent to the town of Los Gatos and the city of Saratoga, California. There are no businesses in Monte Sereno – just homes, the post office, and the city office building along Highway 9. Monte Sereno shares some services with Los Gatos, such as police and schools. While Los Gatos has two zip codes, 95030 and 95032, Monte Sereno shares the 95030 zip code with Los Gatos. Some folks mistakenly think that whatever is happening in Los Gatos with the housing market is also reflective of the Monte Sereno real estate market. They are sometimes quite different. We’ll now look at a few key indicators to see how the Monte Sereno real estate market is doing, and also how it’s doing compared to the same zip code but in Los Gatos. Graphs and stats are from Altos Research, to which I have a subscription (and the right to republish this information), which uses current listing data (list prices, not sold prices, for instance). About once a month I also publish an update which uses information from the solds, and you may see that interactive report at any time by visiting http:www.popehandy.rereport.com. This first graph displays the trend of inventory among houses for sale in Monte Sereno, 95030. The four different lines are for the four quartiles, or price points. Sometimes they behave differently from one another, but here we can see that for much of the last year, inventory rose dramatically among all price ranges. 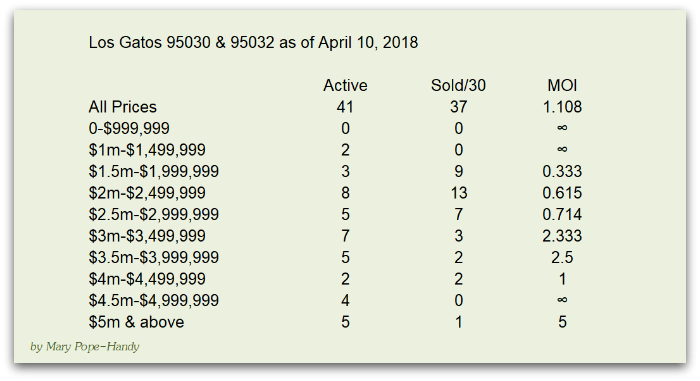 Next, a comparative look between Monte Sereno and Los Gatos inventory levels of homes for sale. 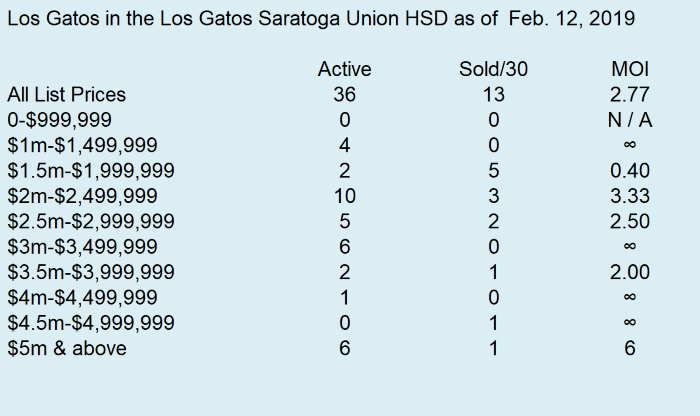 While it makes sense that Los Gatos has more homes for sale (it has more households!) it is interesting to note that the rise of inventory has been more dramatic in Los Gatos than in Monte Sereno. Below, please see the breakdown by price point, or quartile, of the days on market for Monte Sereno this year. The lowest priced homes did not experience the same degree of a “dip” in the first half of the year that the higher priced homes did. It is interesting to note that the most expensive homes had the greatest improvement for the DOM (Days on Market) early in 2008. How does this compare to the same zip code in Los Gatos? 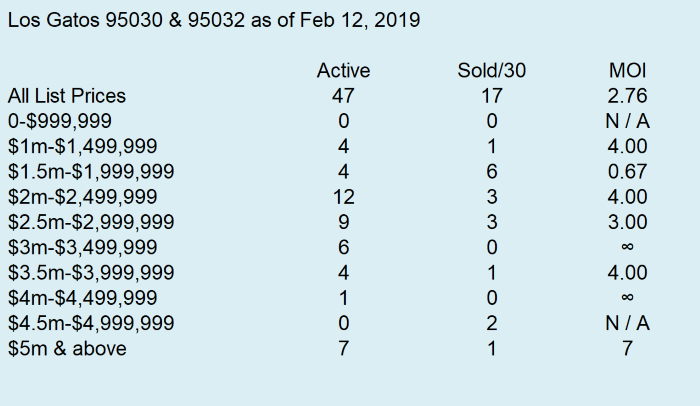 The patterns are pretty similar, but it would seem that for most of the year, it has been easier (faster) to sell a house in Monte Sereno than in Los Gatos. Compared to two years ago, how do the DOM look in Monte Sereno? As we had suspected, it was much easier to sell a home in 2006 than it has been in 2008. In fact, it looks from this indicator that it is approximately twice as hard to sell a home now, if not more, then in 2006. This has been especially grue in the last quarter of the year. Now we’ll turn to the number which home sellers care about the most: price. Below, please see a graph with the median list price by quartile of homes for sale in Monte Sereno this year. Interestingly, the most exclusive homes have come down the most, while properties in lower price ranges seem to have adjusted downward the least. How does this compare to what’s happening in the town of Los Gatos? It is commonly known that homes in Monte Sereno are a bit more expensive than those in Los Gatos, so the gap between the two is not surprising. That said, the way each has responded to the market is curious. While Los Gatos home prices (list prices) went down early in the year, they went up in Monte Sereno for the same time frame. In fact, these two graphs are almost completely inverse of each other! Finally, how does the median list price of homes in Monte Sereno today compare to the list prices of two years ago? This is another weird graph which almost looks like a symmetrical inverse from 2008 to 2006. List prices today are higher, on average, then they were two years ago. In summary, compared to Los Gatos, Monte Sereno is faring better overall. The inventory is lower, days on market are shorter, and list prices remain higher than in Los Gatos. Compared to two years ago, it’s tougher to sell a home (and easier to buy one) in Monte Sereno: inventory is up, days on the market are up – but list prices are up too, an odd twist! In fact it’s an anomoly for most of Silicon Valley, but it does not mean that any one house will necessarily sell for more than it did 2 years ago. The median sales price is the point at which half the homes are selling for more, and half for less. So a higher median list price or sales price may simply indicate that more expensive homes are selling. That seems very likely because with the more expensive homes, buyers are less likely to be dependent on a loan. For analysis of what’s happening in your neighborhood, or where you’d like to buy a home, please contact me. I’m happy to meet with you and go over your situation in person and in confidence.